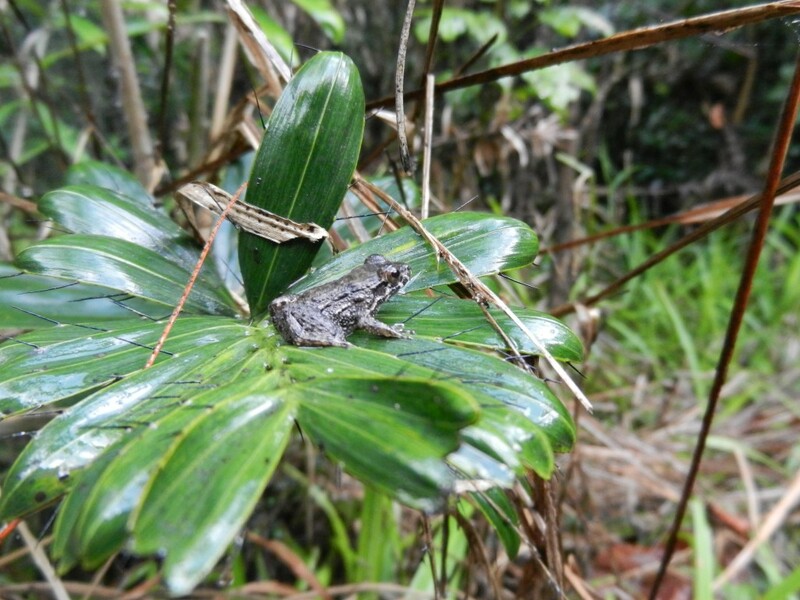 A frog we met in the jungle. We awoke this morning to sunrise over the river. Local Riverinos were paddling their dugouts in to shore carrying a few goods to market. Black eagles swooped low over the water and further off a line of emerald-green vegetation shimmered in the gathering heat. Our boat was moored down below and we picked our way out to it over a raft of logs. As soon as we were aboard we set off at high-speed up the Amazon. The Amazon here is wide and brown; it is full of floating vegetation and debris, from leaves to huge trees. The helmsman steered us around most of those but we came to an abrupt halt at one point when we smashed into a submerged tree trunk. 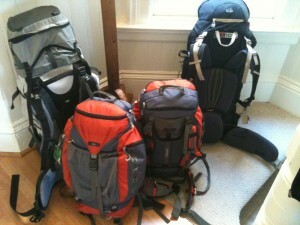 After about an hour we stopped at a trading post. This was a small, palm thatched house sitting on a raft of enormous logs. Dolphins gamboled in the waters next to the raft and a small group of locals sat preparing food. Soon the reason for their preparations became obvious: a local boat crowded with people and animals put in and was immediately boarded by the food-sellers. Cal getting a drink to help recover from the Bullet Ant bite. We motored on for another couple of hours seeing birds, clouds of butterflies and many locals paddling about in dugout canoes. Eventually we turned a corner an came to our lodge. The Lodge is entirely built of roughly finished wood and forms a wide crescent on a bend in the river. In the centre is the dining area and rooms; at the end of one arm is a laboratory; at the end of the other, a large room with hammocks and rocking chairs. I suppose you’d describe it as rustic but comfortable. After lunch, our guide, Christian, armed himself with a machete and we set out into the jungle still dripping after a torrential tropical downpour. 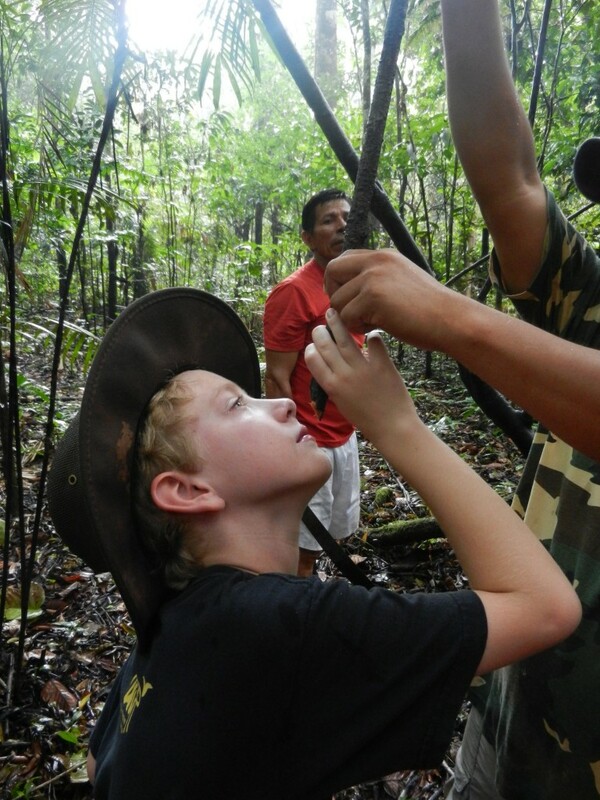 In the course of three hours walking through the jungle we saw frogs, toads and centipedes. We ate some of the hollow tree that is the sloth’s favourite food and has recently started being harvested as a diabetes cure. We pushed through swamps and balanced on fallen trunks over ponds. Callum got bitten by a Bullet Ant – a very painful experience. Pygmy Marmoset - photos were a bit tricky to take. The best bit though was seeing primates. We saw Capuchin Monkeys and Squirrel Monkeys in the middle-distance. 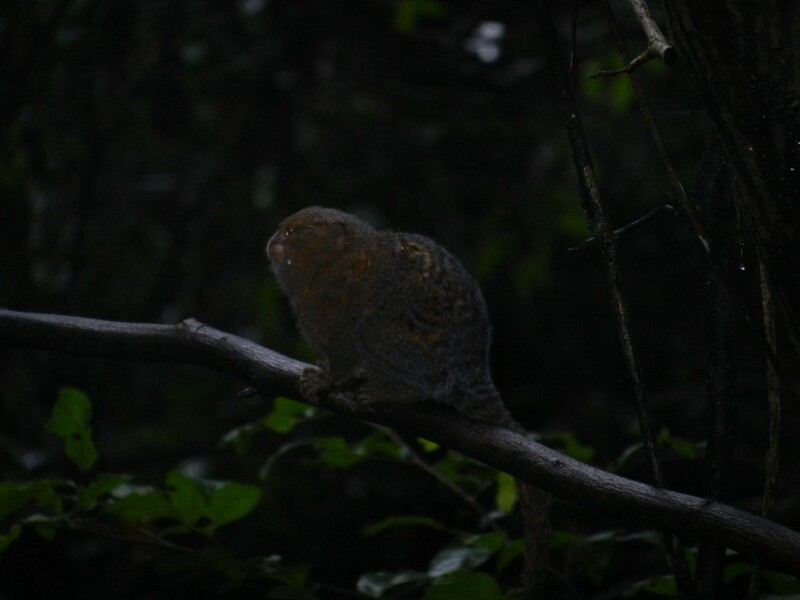 But then as we made our way back in the dusk we ran into a group of Pygmy Marmosets. We’d seen some of these before in zoos, but it felt completely different seeing them in the wild. The Capuchin is too wily to let people get near, but we got within a few feet of the Pygmy Marmosets, partly thanks to a passing hawk proving a greater potential threat than us. Now we’re sitting in the hammock room listening to the evening sounds of the jungle close in around us. The river is still but there is someone paddling past casting tiny ripples. Cicadas remind us of home, but their background sound is overlaid by calls and screeches that are entirely foreign to our Australian ears. I’m looking forward to sleeping tonight in our room, which is screened against mosquitos but otherwise largely open to the jungle. Because this is a research centre we have some Internet! But only some.